Getting the right balance for your weight training frequency can be tough. But the basics can be summed up pretty simply! So, ALWAYS LISTEN TO YOUR BODY! It knows how you're doing and what state you're in far better than a plan from a book, brochure, or website does. When sore, rest; when healthy, work out. At first this sounds fluffy, but you really need to get in tune with your body. Find out what being really sore feels like, what a negligible amount feels like, and where you're at most of the time. Don't kill yourself when you start lifting! In the beginning, your weight training frequency will be pretty low. Establishing the habit of working out is far more important that making yourself so sore that you can't get out of bed the next day. Forgive yourself for going only twice a week in the beginning, ore three times if you're in better shape; gradually keep the intensity and/or the frequency of your workouts increasing. Have faith that your diligence will be rewarded - because it will be. Go for that intense burning, tired, yet slightly energized feeling after your workout. Lookout for sudden pain, ripping, or an immediate increase in pain - those mean injury and that you've been training too frequently (or with poor form). If you're working out really hard and very intensely, you should abbreviate your workout training frequency. Only work out twice a week if your workout leaves you on the floor, gasping for breath, with the room spinning. You'll be getting stronger, which is what's important. Judge yourself by how much more weight you're lifting now rather than a few weeks ago, or by how many more push-ups you can do... rather than by how religiously you've kept to your original schedule, or what that magazine says your exercise frequency should be. Made progress? Great, keep going! Not going anywhere? 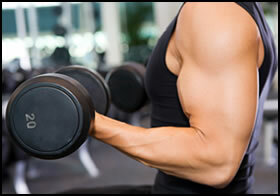 Start working out more or, if you're sore, overmotivated, and in pain, add some resting to the mix. Yes, fun! Maybe not fun like eating cake or lying in a hammock, but you should be enjoying your workouts. That will keep you doing them regularly. And since this is a long process, weight training for probably the nextfew years to see great results, enjoy it. It's a long road. Relish the journey, appreciate the path and the scenery; don't spend the trip fretting and looking down at the dirt. For me, finding the right weight training frequency is a struggle to balance that fire in my belly to work out hard with a cool, calm plan to make progress. Too much fire, I hurt myself; too much planning and recovering, and I don't make progress. Use these ideas to find out what works for you. • Click here to leave 'Your Weight Training Frequency: Doing It Right' & go back to the Complete Strength Training Home-page!